(Amanda:) This was our second weekend in-a-row camping, and since we were only able to pull off another one-nighter we headed to Mt. Baldy. Last time we camped here was in the summer of '09 and that time we were one of the only ones there, it-was-amazing! We woke up the next morning and hiked the ski hut which is a great hike. This time around we were laid back and enjoyed camp-JW style. It being the first weekend of summer we expected it to be crowded, and that it was! We love Baldy, and Manker Flats, but perhaps the best time to come would be the off season or on a weekday. Unless you don't mind people everywhere, and the noise... OH GOD, THE NOISE! For the second weekend in a row we had to deal with LOUD campgrounds. This time there was a huge family that started playing this crazy game around 10pm where they blasted a song and everyone screams and tries to guess the name of the song? At least that's what I thought was going on... whatever it was, they were LOUD! They even woke up JW once... you don't mess with my baby's sleep! Once again little JW was a champion camper. He can't walk yet so we keep him in his pack-and -play and when he gets bored of that we let him crawl around in the tent. 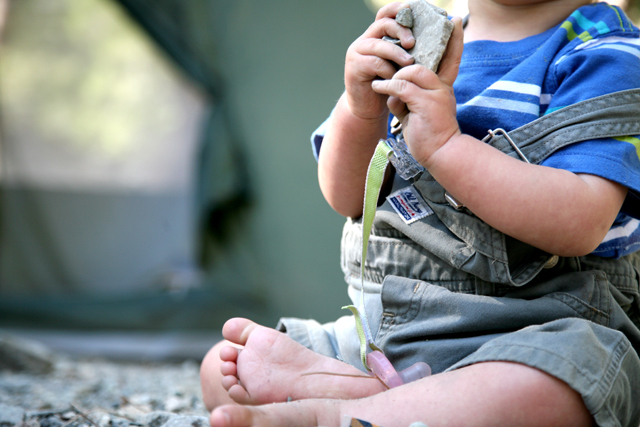 Every once-in-a-while I will let him play in the dirt... but most campsites end up having broken glass in them.... such a bummer. It takes a while for me to comb the area to make it safe. One thing I love about camping is that JW sleeps in later! A whole whopping 30mins to an hour! May not seem like much, but it's like gold! This is the life! 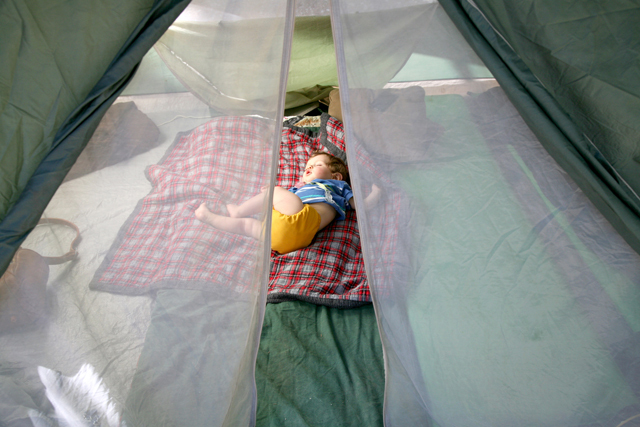 Napping in the tent on a warm Saturday afternoon. The campground itself was very full that night with a few very large parties - what did we expect?! It was the first weekend of Summer. So, if you like your campground nice a quite at night this is not the place for you on busy weekends. The campground has suffered the fate of all campgrounds this close to a very large population. But come here during the week or during the off season and you're in for a peaceful treat. 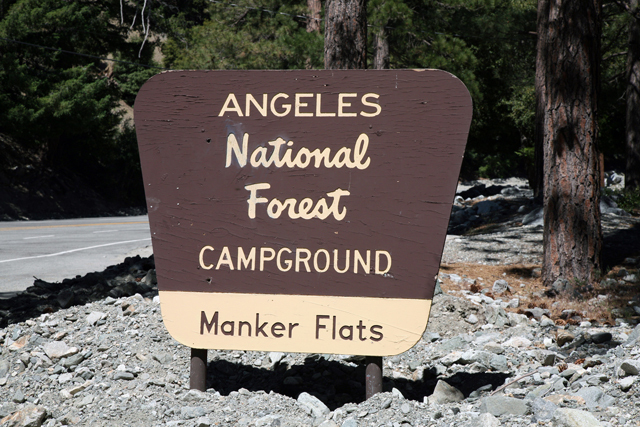 The campground is most widely known for its proximity to Mt. Baldy which towers over the campground to its north. 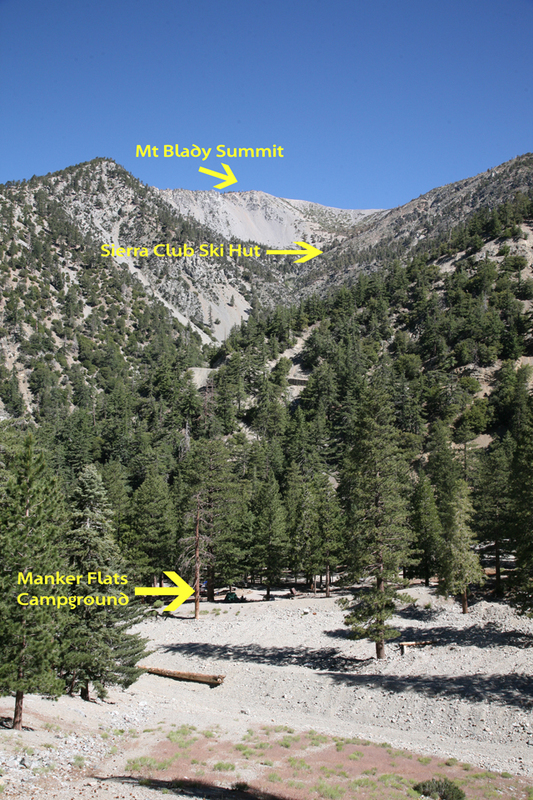 The Sierra Club's Ski hut, where southern Californians skied for the first time in 1930's lies just south of the bowl on the upper reaches of San Antonio creek and can be seen if one takes a short walk up the old ski runs directly behind the campground. 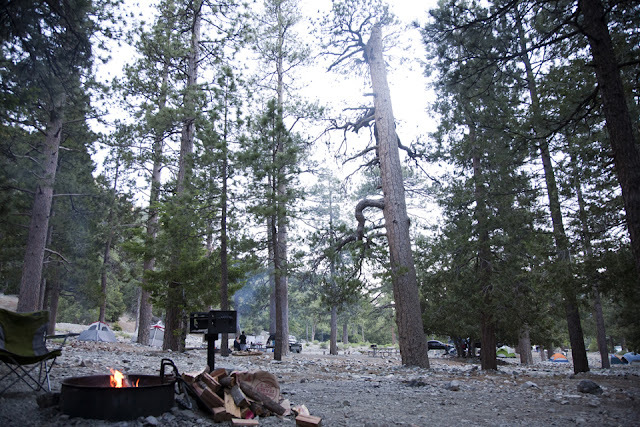 The campground lies on the site of "movie slope" which was a part of the first incarnations of the Mt. Baldy ski resort. The area got the name from the 1930's era movie stars that frequented the slopes. 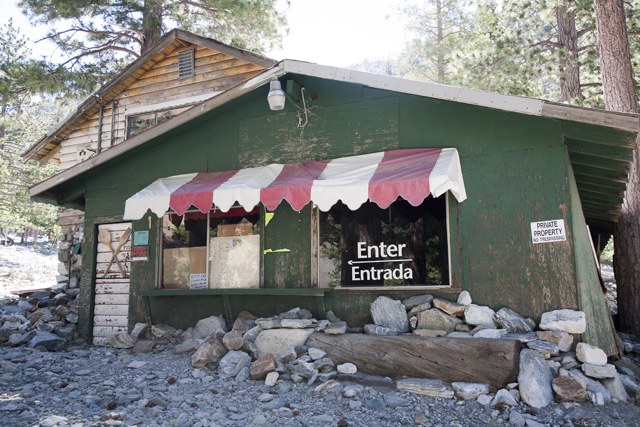 This is the old ski lodge turned snack shack that was recently damaged by a rock slide. 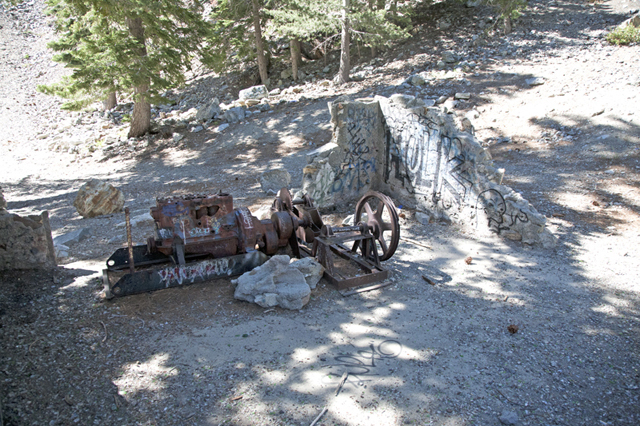 The remains of the old tow rope lie just behind the campground a short way up the slope. A very short walk down the road to the west of the campground lies the Snow crest lodge. A "mountain style" lodge equipped with private cabins, restaurant, full bar, swimming pool, and a reception hall. On our most recent visit the Snow Crest was holding a large party and the music of choice was anything with a house beat and they played it loud until about 11pm that night. Once again JW did not seem to mind all the noise but the ever so consistent thud thud thud of a house beat is not what I want as a sound track to my campfire. 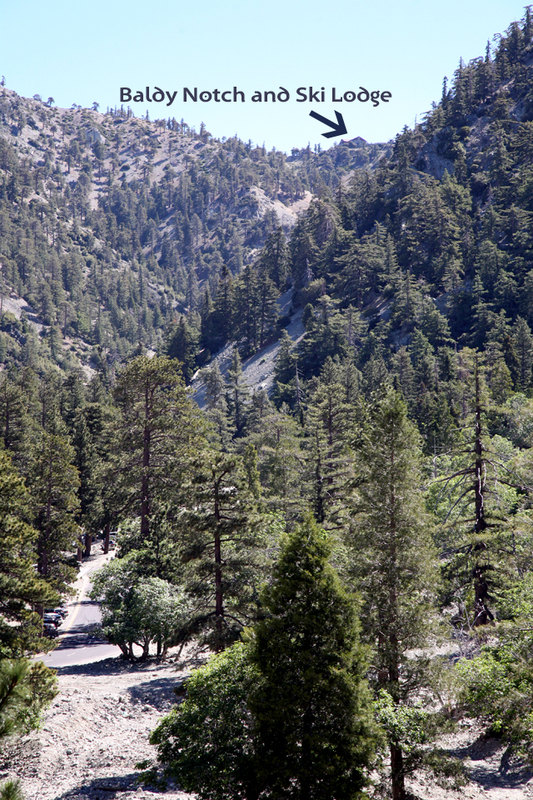 To the east of the campground at the top of the canyon lies the Baldy Notch, home of Mt. 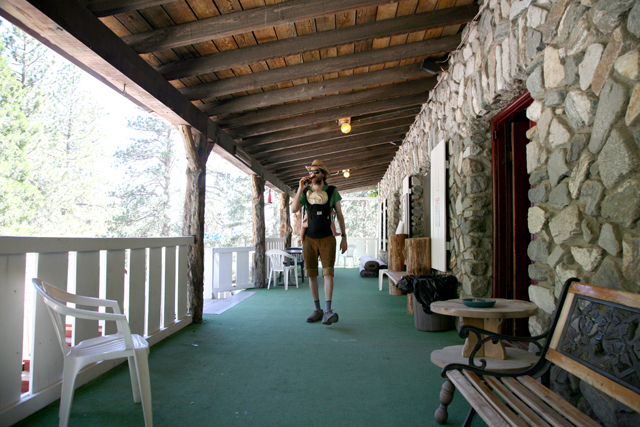 Baldy Ski resort's main lodge which can also be seen from the old ski slopes behind the campground. The campground lies in a sparsely filled pine grove on the floor of a small canyon. This is a view from our tent. The campsites are spread out but it's very open and you can see everyone in the campground. In Claremont, CA, at the intersection of Foothill Blvd and Mills Ave, take Mills Ave north 2.1 miles to an intersection (Mt. Baldy Rd). Turn right onto Mt. Baldy Rd and go 9.8 miles to a "Y" intersection. Bear left, staying on Mt. Baldy Rd. and go 2.3 miles to campground sign. Turn right at sign into campground.